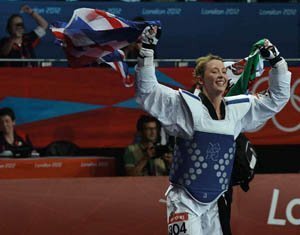 Jade Jones does a lap of honour after winning Taekwondo gold. Her emotional reaction after the bout was one of the highlights of the Games, never has a protective helmet been thrown so high! Her win lit up the town of Flint in North Wales. Great Britain's Jessica Ennis just after the 100m hurdles of the women's heptathlon. Her time would have won gold in the individual event at Beijing, quite remarkable for a heptathlete! She went on to win gold, cementing her position as one of the most loved and recognised faces of London 2012. For athletes, competing in a home Olympics cannot get any better. Is the same true for photographers and how did this gig rate alongside others that you have done? Well I have covered the Ryder Cup, football internationals, FA Cup finals, etc, but the Olympics are above all this as it's the biggest sporting event in the world. Like everything I do, I try to not get too caught up in the hype because it can become an unnecessary distraction. Of course I was privileged that CameraSport saw me as one of the photographers who would represent the company at the Olympics. If you asked a journalist friend of mine who was also there he would probably tell you I was a miserable sod. It was not that I did not like being there; I had a job to do and wanted to get it done well despite the obstacles that inevitably arose every day. Sorry, but that's just me, I was the same at the Ryder Cup. One thing that events like this are really good for is you get to meet other working photographers, and we are all in the same boat; we are all working as hard as we can and are mostly running on adrenaline.